In Japan, Kyoto Prefectural Police have arrested a 28 year-old man. His crime? Allegedly forcing an elementary schooler to play Grand Theft Auto against the child's will. 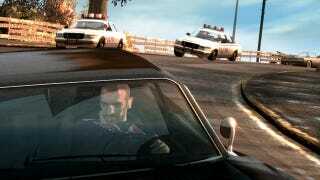 According to reports in MSN Japan and Yomiuri Online, the suspect, a 28 year-old male nurse named Maasa Kawabata, allegedly made his wife's nine year-old son from a previous marriage play GTA IV. Authorities say the suspect made the child play the game for between two-to-three weeks, for about two-to-three hours a day when the mother was out. "I did not force him to play the game," Kawabata is quoted as saying. In Japan, the Computer Entertainment Rating Organization gave Grand Theft Auto IV a "Z" rating, making the game ages 18 and up. Kawabata married his 31 year-old wife in October 2012. That November, he moved in with her and her son. According to Japanese media reports, Kawabata called the boy names like "stupid" and "moron" and even told him to die—supposedly when the mother was not at home. Last April, the boy complained of having headaches and stomach pain as well as feeling nausea, causing the mother to cease living with her husband. The following month, a doctor diagnosed the boy as having dysautonomia brought on by stress from playing the game. That June, the mother reported the incident to the police, who finally arrested Kawabata earlier today. News reports don't say whether or not being called names by the mother's new husband brought on the child's illness. They do mention the "violence" and "brutality" of Grand Theft Auto IV, however.